Of New Music there is no end. This is how of course it should be in a healthy music world. Today we have the chance to consider a volume of seven new works by seven composers that many of us know little about. 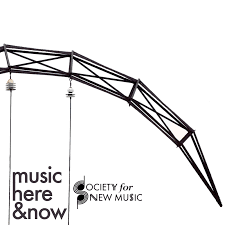 It is brought to us by the Society for New Music. The two-CD set is aptly titled Music Here & Now (Innova 970). By anthologizing this series of World Premier Recordings the Society gives us a feeling for some of what is new in New Music spheres. As we sometimes see now, there are many composers out there working within tonalities. It is a given in Pomo avenues. How that works out can be tremendously varied, as the music on this anthology attests. There is to be heard in this set jazz influences, a shade of beyond-Minimalism, Neo-Classicism, and Modern laced adventures that bring some of last century's experimentations into newly codified terrains. Rhythm in a forward moving way is another element you can hear nicely as a salient aspect of some of these works. Performances are of a uniformly high caliber. Sufficient rehearsal time has been put into every work. The final recordings are vigorous and tender or contemplative as called for. Nothing is lacking in the performers. Smaller to larger chamber orchestra configurations are the rule. There are internationalist elements to be heard too, without that being a central focus. So we hear in succession Rob Deemer's "Cantos," Ricardo Zohn-Muldoon's "Jacaras," Gregory Wanamaker's "Music from a Story Within a Story," Zhou Tien's "Morning After the Deluge," Jorge Villavicencio Grossman's "Whistling Vessels," 'Doctuh' Mike Woods's "Libations," and Mark Olivieri's "Concertino: Stress Test." Multiple hearings confirm the music as consistently well wrought and interestingly moving. Take the plunge with this one and you will doubtless gain another perspective on what is new out there. New and excitingly so.